Flutter vs React Native: Who is Winning? There was a time when the mobile app development industry was only restricted to developing an app individually for iOS and Android, but tables have turned now, 100%. Today, investing in a mobile app development company that excels in developing a single app that would work on both Android and iPhone, on one codebase, has become the trendy business agenda. A guide to Cross platform app development a.ka. ‘The Trend’ became mainstream when Facebook launched and popularized its cross platform app development framework called React Native back in 2015. Ever since then, businesses – to avail the cost and development benefits that React Native had to offer – had been moving to the framework after getting a staring-at-profit answer to the question ‘Is React Native the Right Platform for Your Next App?’. And thus, without an ounce of doubt, React Native got popular and the top shots like LinkedIn, Instagram, Walmart, etc moved to the platform. A popularity that got a dent, a rather impactful one, in March 2018. Google in the Mobile World Congress announced the beta release of its own cross platform SDK called Flutter. And, in just a matter of 2 months, Flutter App Development Companies have been able to develop apps that are competing neck to neck, backed by the power that Google has bestowed upon it in shape of the features, with the React Native apps on the stores. Coming back to today now. The present day situation is that Flutter and React Native have gone into an open war of traction and mass adoption and the search query of either of the frameworks comes back with the result showing – ‘Flutter vs React Native’. Both Flutter and React Native have a stark difference when it comes to the building blocks that they use for their UI development. While on one hand React Native taps into native Android and iOS components with the help of third party or custom components, Flutter functions with proprietary widgets that are 100% customized. These widgets are both in Material Design for Google and Cupertino for Apple. Native look and feel is something that both Flutter and React Native are promoting as their USP. While the performance that is a sign of React Native Development is available for the world to take a peek in and explore, same can’t be said with guarantee for Flutter. Although, Flutter with its feature to use device’s core functionalities without any third party component, has what it takes to go far in the journey of developing native look and feel apps for iOS and Android. This added to the point that Flutter has set the animation standard at 60fps is a clear sign of its high performance. Lastly, since Flutter is compiled into the native ARM code for both Android and iOS, performance is the one issue that it would never face. React Native was first released in 2015 while Flutter first Beta release was made in the Mobile World Congress which was held between February 26th and March 1st. So, talking about maturity, Flutter is a lot less mature as compared to React Native. Since it is still in its infancy stage, Flutter will take some time before it gets mature. Now, because Dart is very new and Google has a habit of killing off languages like what it did with Angularjs, the adoption rate in the industry is not very high. But the subset of the developer community that has been working it has all good things to say about Flutter. Since Flutter is considerably new in the cross platform industry, the number of businesses that have adopted the SDK for developing their cross platform apps are very less. While on the other hand, React Native showcase page of apps that have been developed using the framework is much higher. However, the fact remains that even after being new, brands have launched apps on the SDK which are rather complex like Google AdWords or Hamilton Musical, and even an eCommerce giant like Alibaba. Flutter’s setup process is much more straightforward as compared to React Native. Flutter comes with the provision of automated checkup of system problems, something which React Native misses to a great extent. When it comes to Tooling, Flutter doesn’t match up to React Native, YET. Since Flutter is at least 3 years old, the range of IDEs and tools supporting it are much higher in number. But then, Flutter framework can definitely boast of its compatibility with Visual Studio Code, IntelliJ idea, and Android Studio. Moreover, the debugger, Dart linter, auto format, code analyzer, and auto format tools of Flutter have received some very favorable reviews. Commonly speaking, React Native tends to do a much better work at simplifying the app lifecycle handling and optimization. Flutter only gives you the scope of working with widget inheritance that only allows for stateless and stateful conditions, minus any tools for explicitly saving the application state. I know this doesn’t sound very major, but the developer experience with Flutter have known to be getting affected because of this. While the chaotic state which React Native documentation is in, is expected from a framework that is heavily open source, but it has a lot to learn from Flutter documentation. Google is known for its clear, detailed, and well formulated documentation and with Flutter they have continued the expectation. When you look at the present day comparison of Flutter vs React Native, you will find that Flutter is lagging behind and it is. But the situation is going to change. Flutter in a very short span of time has started getting all the right traction from businesses, in fact when you look at their Showcase page, you will find that the apps that have been made using Flutter belong to the complex category, which is being used by multiple people at the same time. Add to this the libraries that they are continuously adding in their portfolio, along with the on point documentation, and you will get a framework that is ready to take on the cross platform world. In fact, Google itself is not shying away from challenging Facebook on the face. 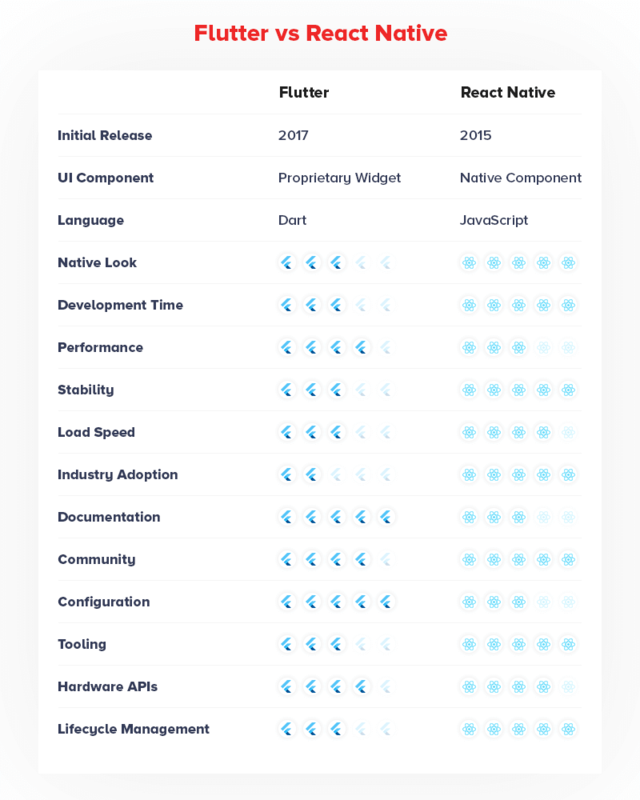 In case you missed the existence of Flutter in depth documentation for React Native, here’s a summarized version. Flutter for React Native is Google’s document helping developers apply their present day React Native knowledge in developing Flutter apps. The document details the Flutter app development process. 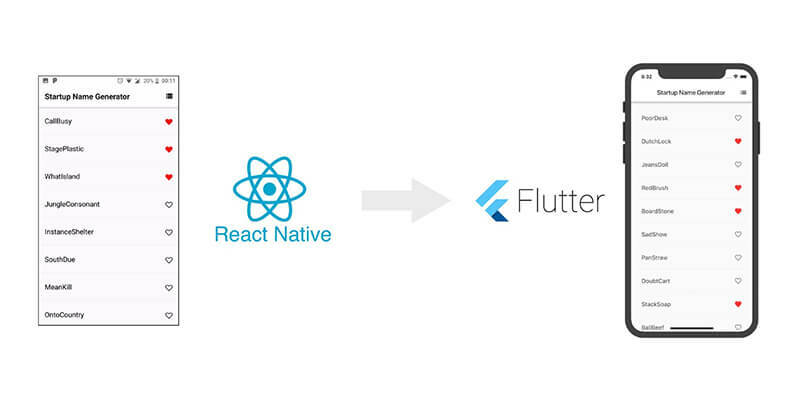 This link particularly explains the flutter for react native, that page intended to show that any developer who has already worked on the react native can easily switch on Flutter. The documentation is a clear invitation for the developers community on both iPhone and Android side to deviate from React Native and experience the ease and flexibility of Flutter. On the face documentation guiding developers to switch from React Native to Flutter is not the only way Google is trying to pass React Native in the race to mass adoption. The move to add Material Theming and Cupertino widget in the cross platform SDK ecosystem has added a whole new punch of expressive user interface into apps developed using the Flutter SDK, something that React Native still lacks and relies on other Design Kits for. To conclude, while yes, Flutter will take time to surpass the popularity that React Native has gathered over time, but give it time and it will jump right on and off the React Native’s user base. “React Native vs Xamarin: The Best Cross-Platform Development Framework,�? “React vs Angular: What to Choose for Your App?,�? 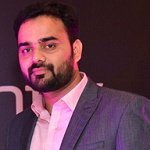 Dileep Gupta, the Chief Delivery Office at Appinventiv is someone who having worked with hundreds of clients worldwide, knows what they need in terms of product and service delivery. Having acknowledged himself with both the human and technical side of an app, Dileep is someone who gets things done to make an app reach its people and then the world, on time and above par met expectations.